In this example, we have defined the run method in the subclass as defined in the parent class but it has some specific implementation. The name and parameter of the method are the same, and there is IS-A relationship between the classes, so there is method overriding. Consider a scenario where Bank is a class that provides functionality to get the rate of interest. However, the rate of interest varies according to banks. For example, SBI, ICICI and AXIS banks could provide 8%, 7%, and 9% rate of interest. 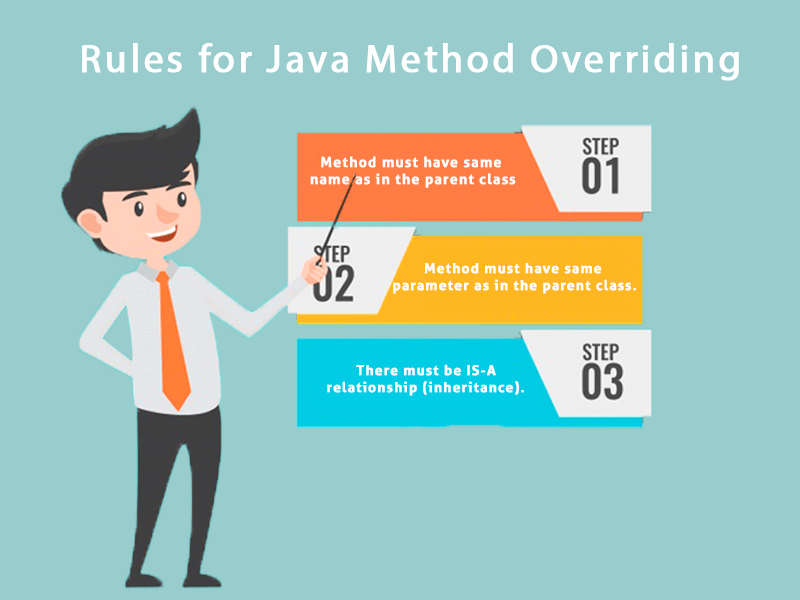 Java method overriding is mostly used in Runtime Polymorphism which we will learn in next pages. No, a static method cannot be overridden. It can be proved by runtime polymorphism, so we will learn it later. Why can we not override static method? It is because the static method is bound with class whereas instance method is bound with an object. Static belongs to the class area, and an instance belongs to the heap area. No, because the main is a static method. Let's see the concept of method overriding with access modifier. Let's see the concept of method overriding with exception handling.